There has been considerable progress and advancement in computational cell biology and this has given researchers powerful tools to simulate metabolic, genetic and signal transduction networks. However there has been little development in designing computational tools to incorporate biologically realistic simulations of systems comprising many interacting biological cells. The necessity to model large ensembles of interacting cells commonly arises in the studies of disease pathology, cancer progression, embryonic development, wound healing and many other important biological processes, and in our case, bacterial quorum sensing. Bacterial quorum sensing has become a very popular area of study in bacteriology. It is a phenomenon in which individual bacteria regulate gene expression by detecting changes in their population density. This is achieved by secretion and detection of auto inducer molecules, whose local concentration increase gives rise to altered gene expression. The ability of bacteria to congregate and reach the threshold density leads to this behavior. This ability might be because of bulk cell growth, or alternatively an efficient method for bacteria to achieve this is by chemotactic motion to form a congregate. We have derived a single cell level probabilistic model based on the cellular dynamics study by Frymer et al. that involves simulation of individual bacterial trajectories. We include a time delay of 0.1 second to account for the time that the bacteria take to tumble. The crucial element in our model design is the tumbling probability (p t ) term that causes the bias of the normal random-walk motion of bacteria in the presence of a chemoattractant. For a given bacteria with a basal tumbling probability pt 0, with a chemotactic coefficient χ0, moving with a velocity v, this term is dependent on mainly the attractant concentration 'a' and the direction vector 'ŝ'. We first simulated our bacterial population in the absence of any chemoattractant. We expect a random walk behavior. We analyzed the probability density function of the bacterial population and it approached a bi-variate normal distribution expected of a random walk at higher time values (100 seconds). We plotted the mean square displacement versus time for various basal tumbling probability (pt 0) values. We observed faster convergence to diffusive behavior for lower tumbling probabilities. The convergence times were measured by fitting the radial bacterial displacements (from origin) to a Rayleigh distribution using a Chi-Squared Test and thereby extracting the exact times of convergence. This is done for various velocities and basal probabilities. The result is shown in Figure 1. We find that there is an inverse relation between convergence times and tumbling probabilities with a scaling factor of 8.896. We can conclude that the bacteria tumble 9 times before convergence. We also added a simple constant gradient 'ε' is added along the x-axis. The bacterial population moves as a whole with a velocity of V c under the gradient ε. 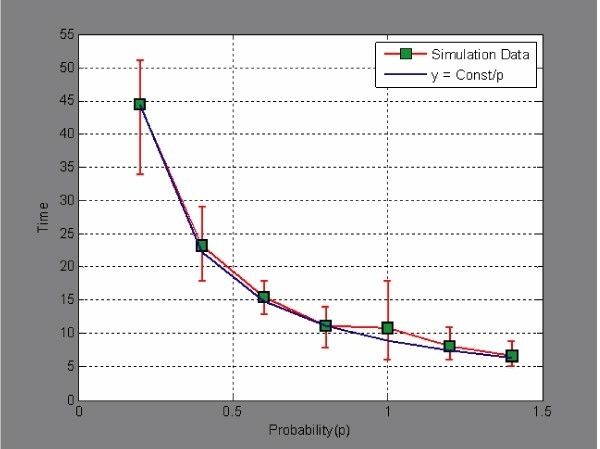 Using Berg & Brown equations , we have Vc = mv tanh(ε) The simulation results point at the chemotactic velocity approaching 0.9 of the bacterial velocity. The diffusion along the x and y axes are different in the presence of this gradient. The relation of coefficient in x-axis (μ) to that in y(μ0) is given by μ = mμ0cosh(ε). Plot of time taken to converge to diffusive behavior versus basal tumbling probability (pt 0). Error bars indicate variations for different velocities considered. Overlaid plot of y = constant/pt 0. There will thus be a transient gradient condition included in our model from the above equation. The current model describes bacterial motion in the presence of chemoattractant gradient. The population parameters compare very well with models from literature and we plan to test against other existing descriptions. We are incorporating this model into a large scale model that describes the complex cooperative phenomenon in bacteria like quorum sensing. The advantage of single cell level model like ours is that it makes it possible for the model to be incorporated into larger systems like a parallel computational platform  and define intracellular dynamics within that system using an agent based modeling technique. Further, this technique can be extended to other biological cells and also in cell-cell communication in multicellular organisms.